Northside Church of Christ celebrated its 40th Annual Homecoming and 63rd Church Anniversary and Gospel Acapella Songfest over the weekend with the theme, “Preparing for the Future…Living in the Present”. 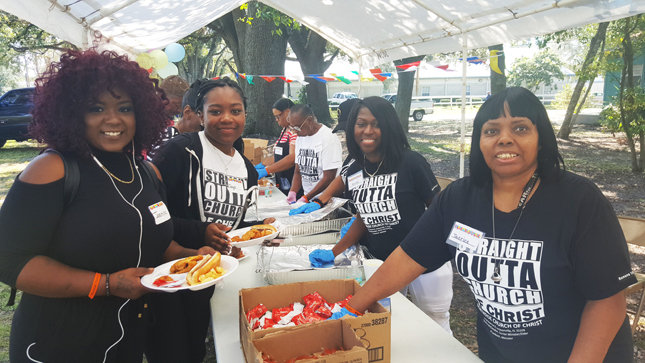 The annual event kicked-off with the 17th Annual Community Day and Fish Fry which featured a free all you can eat fish fry, face painting, mega slide, basketball, and lots of fun, food, music and fellowship for all ages. On Saturday evening the excitement continued with the annual Gospel Songfest Praise Party, presenting acapella music to inspire and stir the soul. The weekend of events concluded with Homecoming Day on Sunday that integrated breakfast, worship service, dinner and program. Shown at the fish fry are church members Jasmine Jackson, Joya Jackson, Neisha Hinton and Tatrice Shotts.